As I write this, I’m enjoying some Boston piped through the Robusto Amp. This was a pretty simple, yet satisfying build. With the bypass switch, I can compare the amp’s sound to the source. So, how does it sound? With crap earbuds, there’s no difference. With slightly better headphones, it sounds a bit “fuller” with the amp, maybe. Overall, the difference is pretty minor (if it exists at all). I need to try two things: Line level input and higher impedance headphones. Even my good headphones are fairly low impedance. The polarity protection diode payed off. While messing with the power supply, I reversed the polarity at least once. I’m not so good on perf boards. Next time, I think I’ll spend a little more time up front laying things out. Also, I think I’ll try not using the component leads as traces, this makes it really hard to get them off the board if need be. 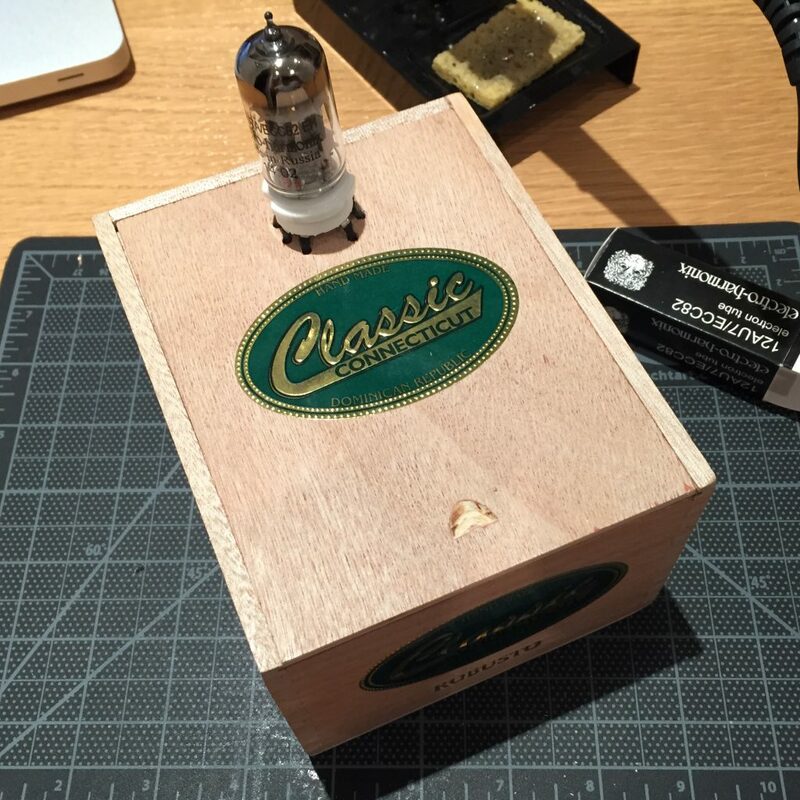 Don’t underestimate the time the enclosure fitting and final build will take. Granted, I’m pretty slow, and I don’t have much of a workshop, but this is a big part of the project. 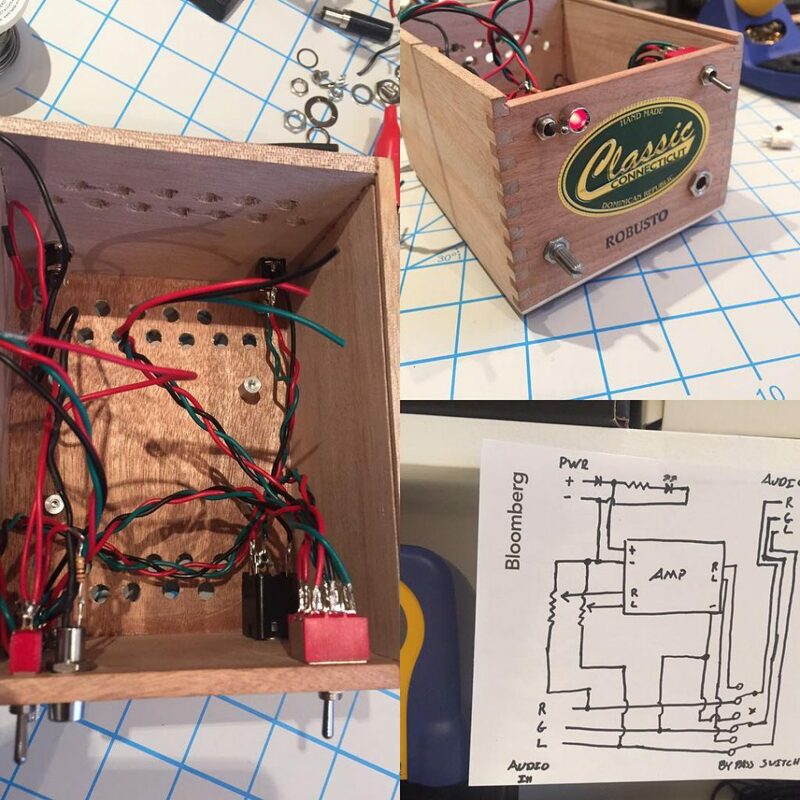 Where putting together a simple circuit on a breadboard is fast, fitting everything and soldering the final circuit can take an order of magnitude longer (for me anyway). In the words of Isiah Whitlock Jr.: Sheeeeit! The LED was flashing, it’s not supposed to flash. After a bit of poking around with the meter, I found the problem: I wired the LM317 regulators improperly. The output was shorted to ground. I carefully disassembled enough to get to the bottom of the circuit board and rerouted a few things. Once the LM317 was wired up correctly, it worked fine. I’m a bit surprised that the components stood up to such abuse. Yesterday was a productive day on the amp front. I made a little progress mounting components on the front panel. 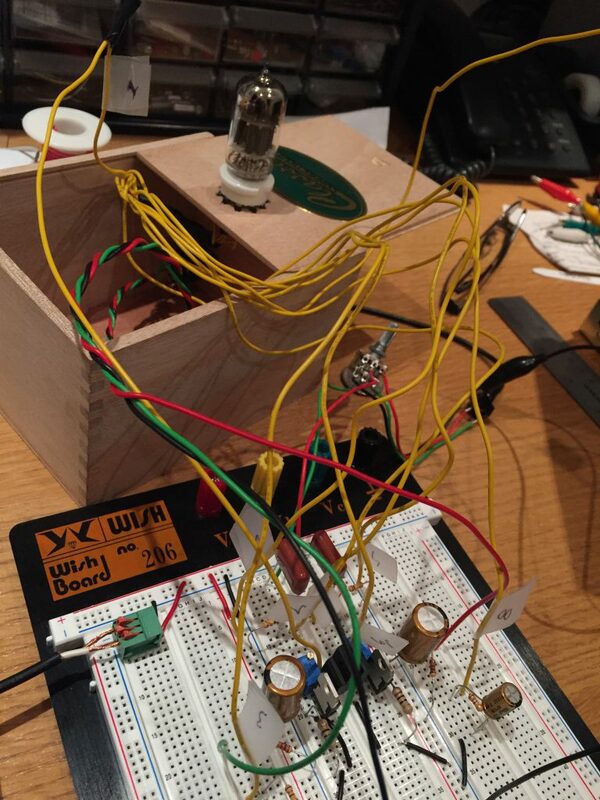 I also made a lot of progress with the electronics. 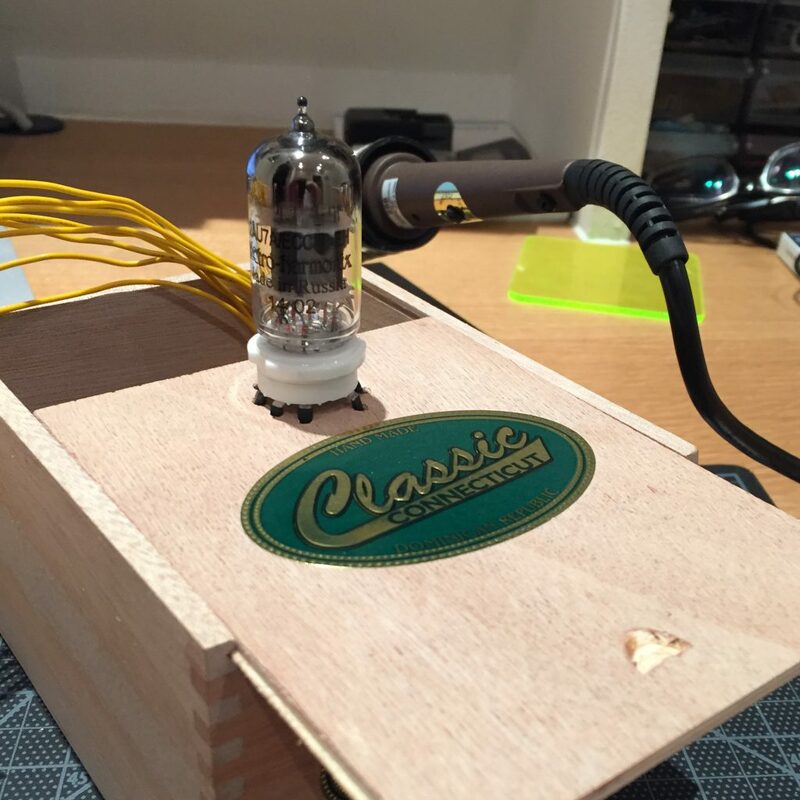 With everything wired up, albeit temporarily, I was happy when I saw the tube glow for the first time, and even happier when I ran some music through it. The amp sounds great. It has a brightness that others have noted, it’s the sort of profile that goes well with the warm sound of first track I played through it (What if We All Stopped Paying Taxes – Sharon Jones & The Dap Kings). It’s not perfect. There is a low level hiss, noticeable only when there is no sound. I’ll have to see what I can do to get rid of that. It also picks up some RFI if something like an iPhone is within a foot of the circuitry. Now I need to work on getting it cleaned up and in the enclosure so the guts aren’t splayed out on my desk. 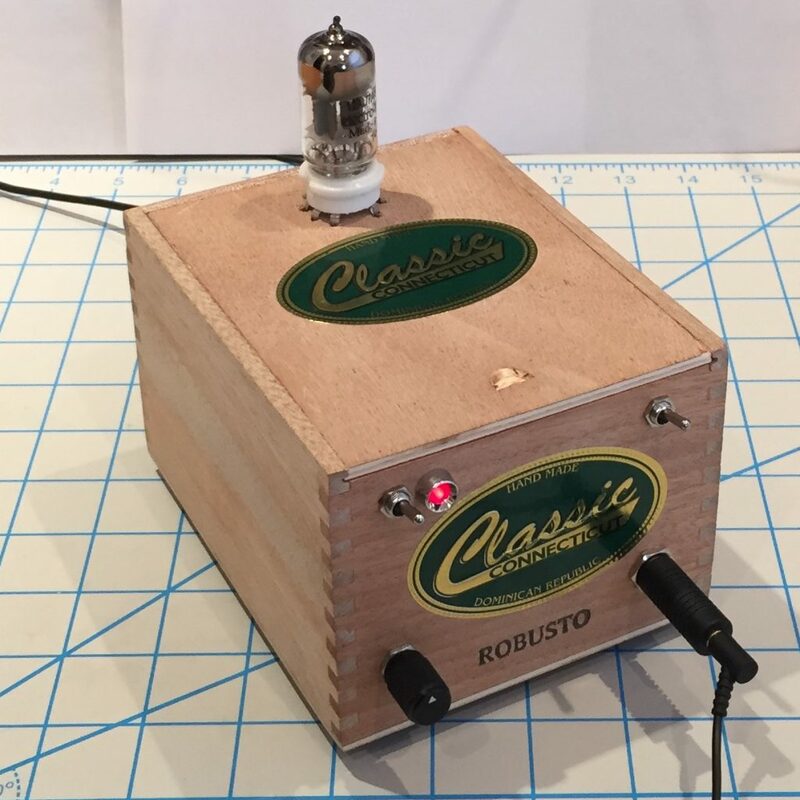 The plan with this headphone amp is to build it on a breadboard first. Partly to make sure it works, and partly because I’m still hesitant to etch my own circuit board. Since the tube wasn’t going to fit on the breadboard, I was looking for something to attach it to, temporarily, so it won’t flop around. I found a cigar box in my small junk collection, which I think will do nicely. I mounted the tube socket on the cover and soldered in some hook up wire. 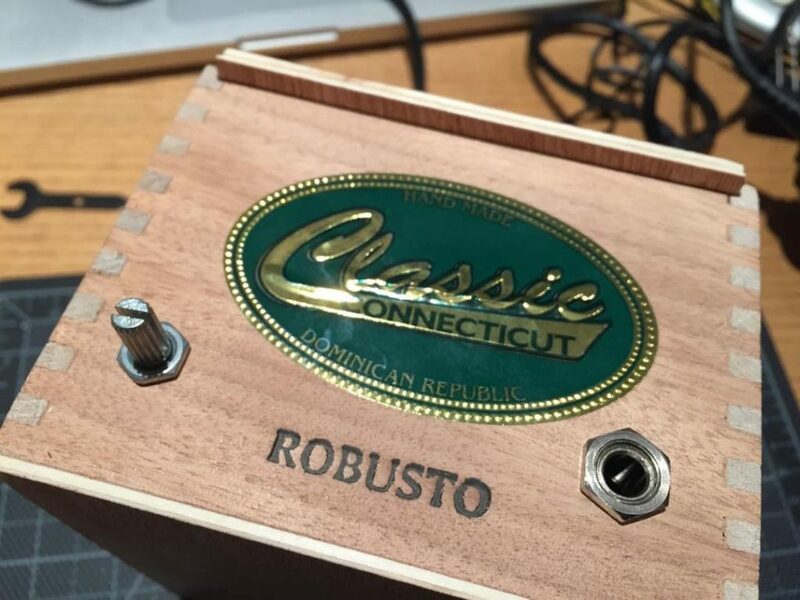 Even though it is meant to be temporary, this little cigar box could function as a permanent enclosure. It will need some ventilation holes though. 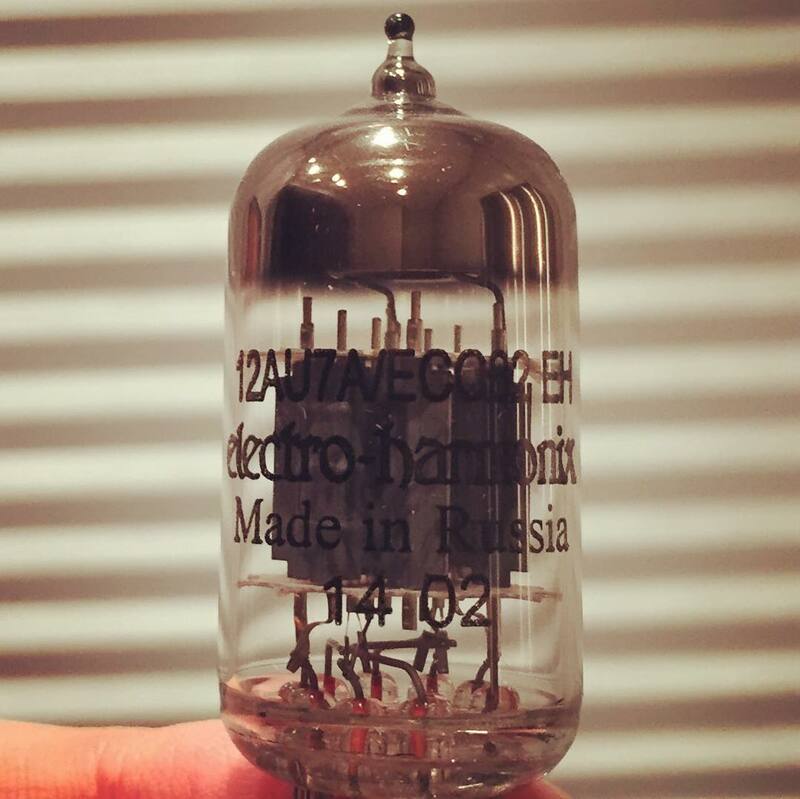 The tubes for the headphone amp were delivered today. The rest of the parts should be here this week. It looks like I may be working on this sooner than I thought.